I hope you've been having a great summer/winter* (*delete as appropriate). I've been having a fun (and exhausting) summer trying to entertain my mini peops whilst Pat has been working and studying hard. We're going on a little late-summer break for a few days tomorrow, so I want to quickly share with you the last of my summer sewing projects. All but the last four items are recent makes and they reflect the changes my personal style seems to be going through. Out with the retro-y, Rockabilly-lite, and in with whatever-you'd-call-it. Anyway, as great as these pieces have been, what I found I was still missing was really warm weather clothes. 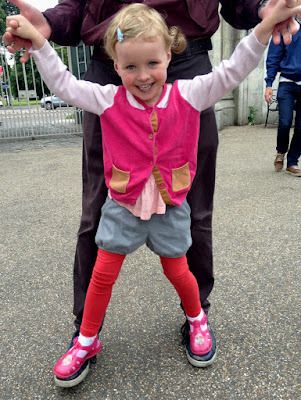 I still didn't have any sleeveless tops or shorts (which is evident thanks to my pasty white upper arms and legs!). To fill those gaps, I made these last two summer projects, which also may be my favourites! Whilst planning my first version of this pattern, I'd spied some other sewers on the interwebs leaving the sleeves off the Delphine et Morissette La Brune pattern. I decided to follow suit. I'm not a fan of my upper arms, but a sleeveless La Brune is a great solution because the shoulder ruffles provide a focal point that steers the eye away from that area of my arms. Witchcraft. I was able to squeeze this top out of the remainder of anchor print light weight denim that I used to make my first pair of Luna pants. It's quite a loose weave, which on the one hand is ideal for a loose fitting summer top (and much softer than the stiff poplin I used for my first version of this pattern), but on the other made the ruffle application a bit of a headache as the raw edges had a tendency to stretch out due to all the handling. I did the best job I could, and I don't think anyone would notice that it has bubbled a little next to the ruffles unless I forced them to! Once the top was nearly complete, I tried it on and decided to cut a tiny bit away at the bottom of the armhole. I then bound the raw edges in the same way as the neck hole using the method used for the neckline of the Scout tee. I bought some ready-made bias binding rather than making my own because I didn't think the loosely woven denim would provide enough stability to the neck and arm holes. Aside from omitting the sleeves, I also made the shoulder ruffles even narrower than I did on my first version, and I now think the proportions are spot on. 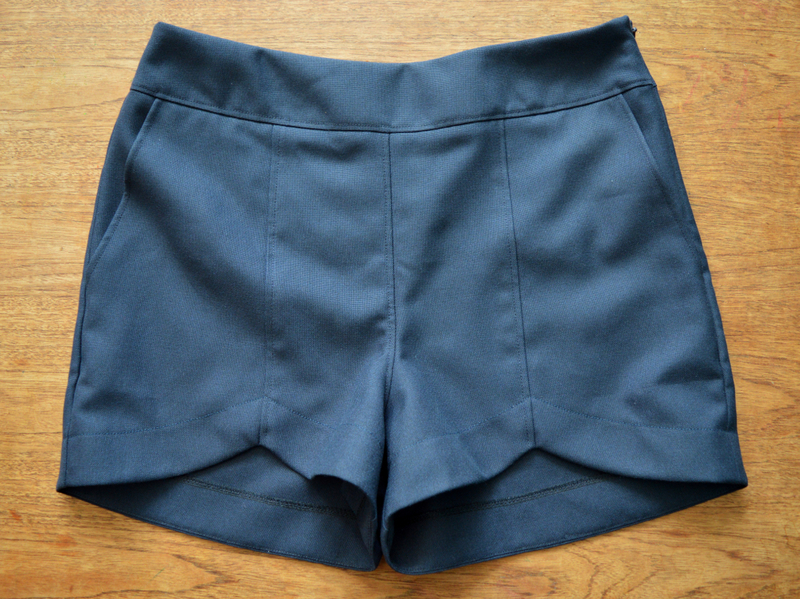 I made them in this navy suiting that has been in my stash forever. I have no idea what the fibre content is, all I know is that it doesn't need ironing (whoop whoop!). 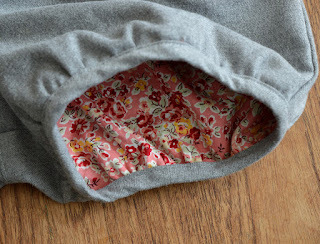 I still have a ton of this fabric left, so I'm sure it'll pop up on this blog in another incarnation some day. I used some turquoise jap silk from my stash for the pocket bags but did a French seam around the curve for a neater finish than overlocking would have resulted in. I added extra topstitching in a few places as the fabric wasn't super-responsive to pressing and I wanted all the seam allowances to lay flat. I think topstitching down the seam allowance along the front rise has resulted in some sort of creases radiating outwards from that area, but it's probably only noticeable if I stand stock still and pointed them out to you. The other tiny flaw that something is compelling me to share with you, is that my top and bobbin threads must have been from different reels because the topstitching that keeps the hem facings in place is a slightly different tone of navy to the rest of the topstitching. Anyway, those things aside, I'm not sure that these photos are doing them justice but these shorts have a really smart, polished look IRL. They are still a bit big, but I expect to gain some weight once Frankie finishes breastfeeding, so that's fine. A lot of work went into them, as much as you'd put into a nice pair of trousers, so I hope I'll get many years of wear out of them. In the interest of equilibrium, I thought I'd share a recent FAIL project with you too. Sewing bloggers rarely seem to share the project attempts that didn't work out. I usually don't either because I doubt it's very interesting to you readers, and also because I just want to forget about a FAIL as quickly as possible! But I'm worried that without ever sharing a FAIL, those who are new to the sewing game may get an inaccurate sense that every sewing project will, or should, work out. Lessons always have to be learnt that way, it's an important (if annoying) part of improving. But due to my new policy of toiling every-damn-sewing-project that doesn't use a TNT pattern these days, I've managed to avoid having a FAIL for ages. I tried it on before hemming (see above) and it was a total 'meh'. 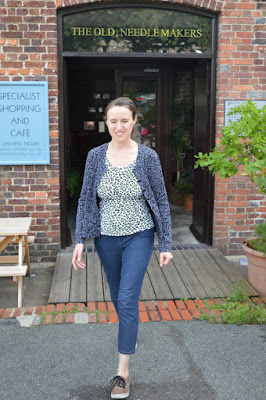 It didn't skim my figure like some sort of contemporary French siren as I'd hoped, instead it felt really frumpy. 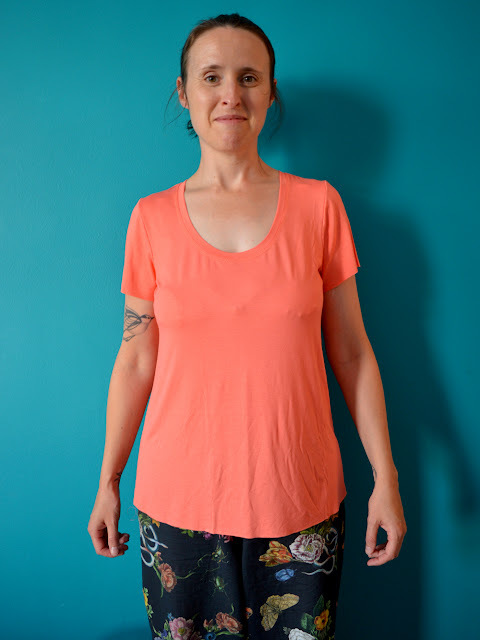 I fiddled with the fit a bit by taking in the side seams here and there, and in the end I salvaged the neckline and reworked it entirely using the TATB Agnes top pattern that I've have many successes with previously. But even that didn't work! The fabric was so thin that it showed EVERYTHING, including the exact shape and position of my breast pads, every detail of my bra, the ingredients of my most recent meal. I was really annoyed because I'd made a nice job of the neckline, but I'd had to finally admit defeat and throw it into the textile recycling bag. GAH. The anchor La Brune and navy Sweet shorts have been such a success that I'm firmly over the coral Plantain FAIL. I've worn this outfit as often as the weather has allowed since their completion, both feel really comfortable, even though the shorts sit a bit higher on my waist than I'm used to. And the sleeveless-ness of the top feels so nice that I can't wait to make more sleeveless tops for next summer. 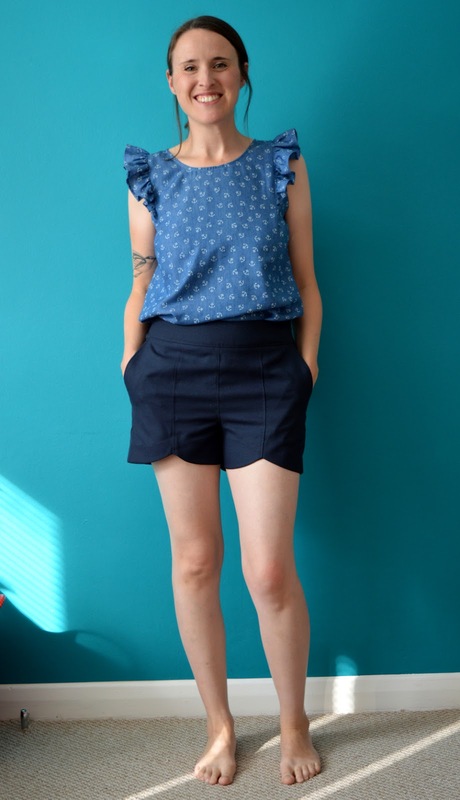 I fancy trying Jennifer Lauren Handmade's Hunter tank, which should work well with these shorts thanks to the high waistline, plus either Made by Rae's Gemma tank or Wiksten's tank top. 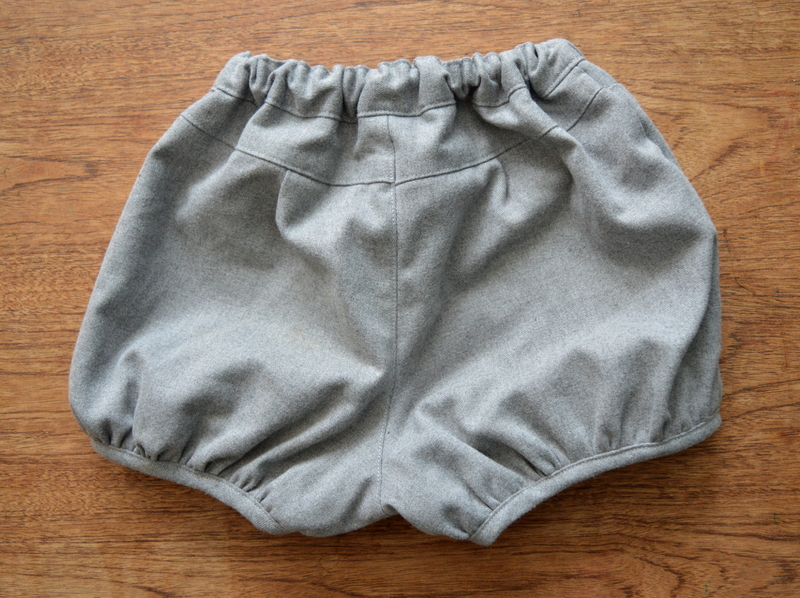 Plus next year I really should finally make the Deer and Doe Chataigne shorts pattern that has been lurking in my stash for a couple of years. What about you? 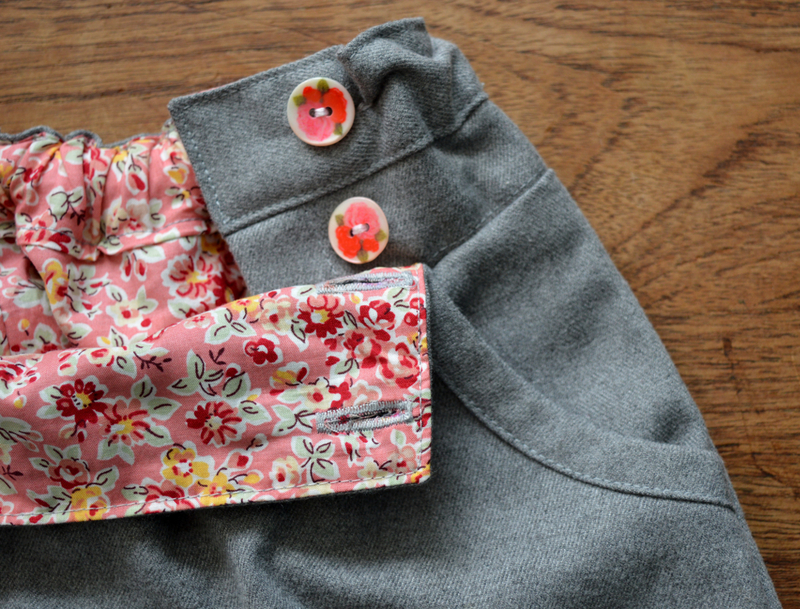 What have been your most successful recent warm weather sewing projects? Any FAILS you'd like to vent about?! So the sad fact is that these shorts are not popular round here. You want to know how many times they've been worn in the four or five months since I made them? Twice. You want to know how long they took to sew? Forever. 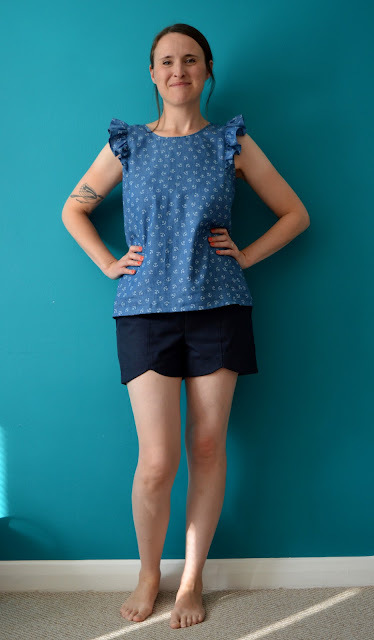 I think I discovered the Berry Bubble shorts pattern via Pinterest, and bought it during a mini-splurge I had last summer, along with the Sally dress pattern. It's designed by Rebecca Page, who recently (wisely) changed her website's name from Mummykins and Me, and it's also available for women (and dolls!) as well. I'm a big fan of a bubble short for little girls, and this pattern looked like a particularly polished version, with lots of possibilities for contrast fabrics and awesome buttons. But BE WARNED, this is NOT the sewing pattern to reach for if you want to knock something up quick the night before you take your kid on holiday. If memory serves, it's comprised of ten (TEN!) separate pattern pieces. 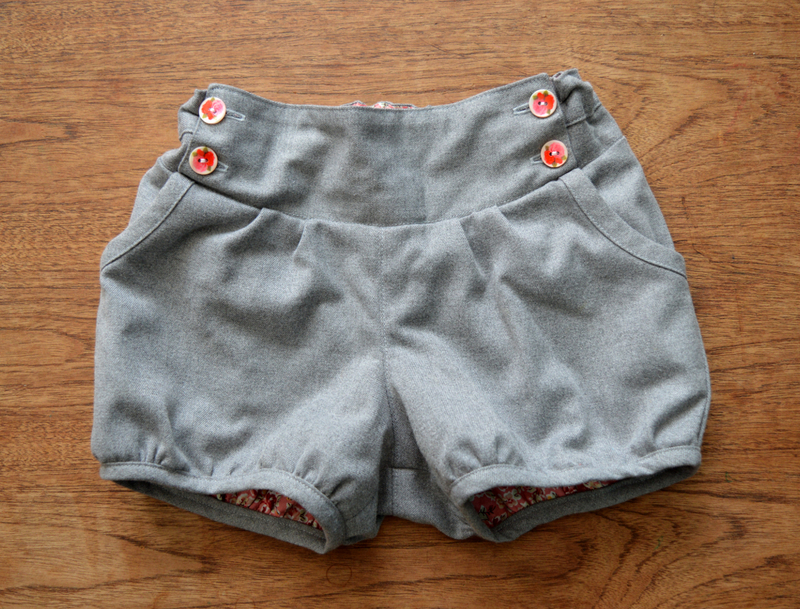 I'm used to kid's shorts patterns that are made of a back and a front and that's it. 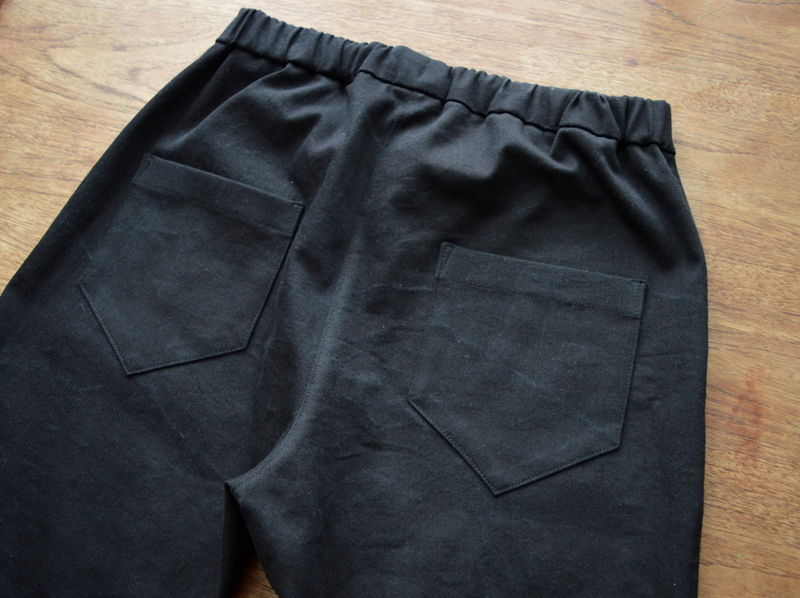 And they're fully lined, with lots of neat topstitching. 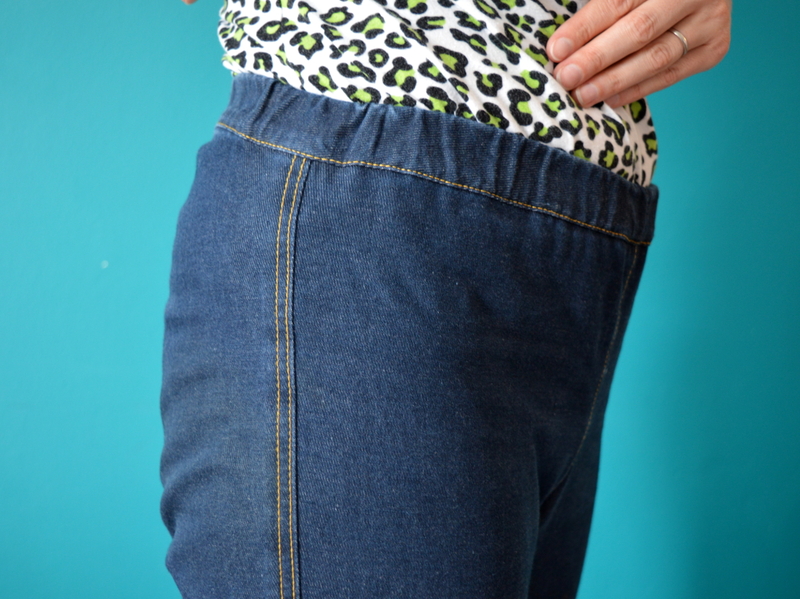 Oh, and did I mention that they have adjustable waist elastic?! These are some fancy kids shorts alright. I made the size 3 (which has come out pretty big, I think they'll easily fit her until she's five) and found the construction fun but pretty fiddly, I wouldn't want to try sewing any of the smaller sizes. If you've been following my blog for a while you will have seen this grey fabric a few times before. 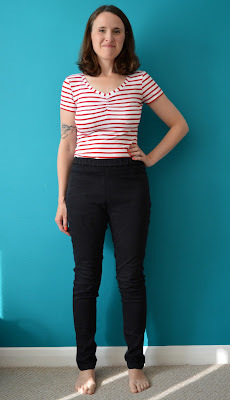 I first used it for these cropped trousers (never worn), then this Tova tunic (which I've worn sooo many times, pregnant and not) and then these nautical palazzo pants (which I've also worn masses but are no longer my style). This is last of that fabric, I promise! I think it's some type of amazing, fantastic quality flannel: incredibly soft and doesn't really crease, both of which make it great for children's wear. 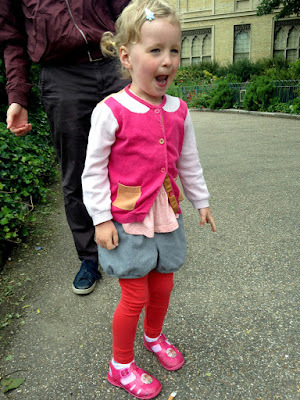 What doesn't make it perfect for children's wear, apparently, is the colour. Even when it's fully lined in pretty floral pink cotton lawn. When I first made them, her dad offered to help her put them on and she replied, 'No, please no'! Yes, you read it right: she begged him not to put them on her. As I say, Dolores has chosen to wear them twice. Once, when we went for a day out in Brighton (pictured here), and today when we went to the beach. Only today, she didn't choose them exactly. I usually give her a couple of outfit options that are weather-and-activity-appropriate, but today I just picked out an outfit for her that included her favourite T-shirt, and to my surprise she put it all on without a fight (she may have been distracted by something else!). So, although they involved a lot of work at a time when my sewing opportunities are limited, plus the recipient isn't falling over herself to make use of them, I still look on this project with a lot of fondness. There's something really satisfying about making a garment from lovely fabric that involves lots of meditative, neat topstitching. I made them whilst binge-listening to the S-town podcast, so I was indulging in two of my very favourite things, which meant this project had double the mental health benefits! It's a great pattern but I'm not in a rush to make it again so I don't think I'll be reducing that total but subsequent uses. Because my old jeggings (the washed-out black ones pictured below) were very much on their last legs, I decided to cut them up so I could lay the shapes out flat, rather than trying to take a pattern from them still as a 3D object. I omitted the back yoke, which didn't seem to be adding anything in terms of shaping, and made the back in one piece instead. I kept the cut up pieces of dissected jegging so I could take some hints for construction. I decided, as per the originals, to make faux-flat felled seams on the outer legs by making closed seams then pressing and top-stitching down the seam allowances towards the back. The inside legs are regular closed seams. I made the pattern full length, as per the originals, but my #1 copy were cropped due to fabric restrictions. 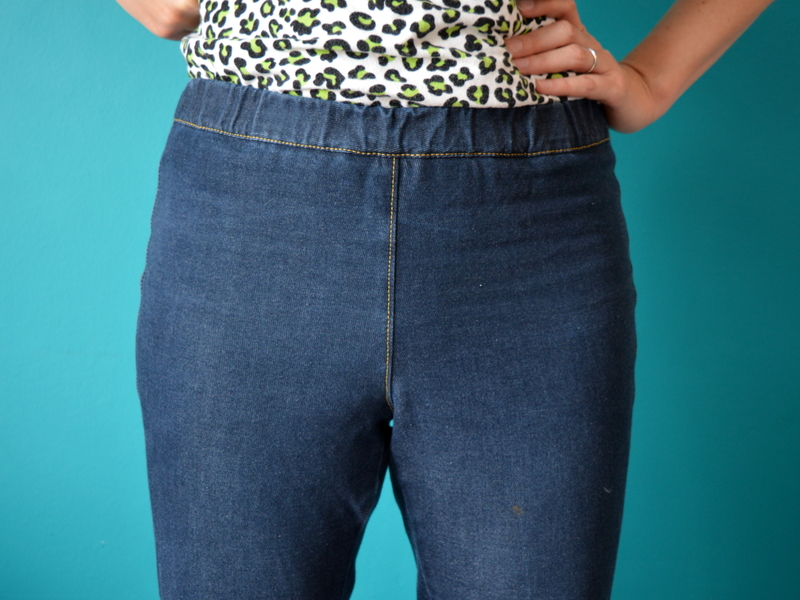 I've had my eyes peeled for decent jeggings-appropriate stretch denim for a while but it's been pretty illusive. 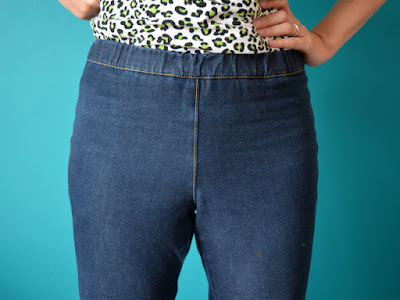 Stretch-denim in general seems to be fairly common, but I need the really stretchy, four-way stretch stuff that's going to behave more like leggings fabric and can deal with an elasticated waist design, rather than the type of denim that you'd buy for making regular jeans that happens to have a small amount of give in it. There's probably a way to describe what I'm talking about using percentages of stretch, but I don't know what that's about yet. Anyway, when I found a 95cm remnant of suitable fabric at a Ditto sale, I snapped it up, even though it wouldn't be quite long enough for the pattern I had copied. Generally speaking, for a first attempt they weren't too bad, and I've worn them masses in the two months since I finished them. I even like the necessity-is-the-mother-of-invention cropped length, which has made them really useful for the summer. And I thought I could get winter use from them if worn with long socks and knee-high boots. So, the bad stuff. The first thing that grabbed my attention was that the overlocking and my faux-flat felling of the outer leg seam felt very noticeable. I probably should have overlocked away at least 0.5cm of the seam allowance before the top-stitching. However, I don't know if it's the wearing and washing softening up the outer seams, or just sensory adaptation, but I realised the other day definitely don't notice it as much these days. Also, I'd say that overall they are a little big, probably because the fabric of the originals didn't have quite as much stretch as the blue Ditto fabric so the pattern is a little bit too large for this particular fabric. And they are also way too high, particularly at the back. I like that I can bend over in a playground with absolutely no chance of scarring anyone for life, but I have to yank them up from time to time as I don't think it's helping the baggy-bumness. After the relative success of #1, which I view as a wearable toile, I was excited to crack on with another pair soon after. So I lowered the height of the waist by 2cm at the front and 3cm at the back (blending between the two at the sides). I decided to leave the overall size/width the same in case my next piece of fabric had a better recovery/wearability than the blue Ditto stuff. I was also excited to try out the full-length of my pattern, which I'd kept accurate to the originals in length and width round the ankles. As for construction, I learnt my lesson and made proper flat felled seams on the outer legs to hopefully reduce/omit the discomfort in that area. I also chose a quicker and less faffy method of attaching the waistband/elastic channel than I did on #1 that I won't bore you with. I was also feeling pretty confident going into this version, so I decided to add some patch pockets for extra interest, seeing as I wasn't using contrast top-stitching this time round. If it's possible to be in love with a piece of fabric, then that's what's happening here. 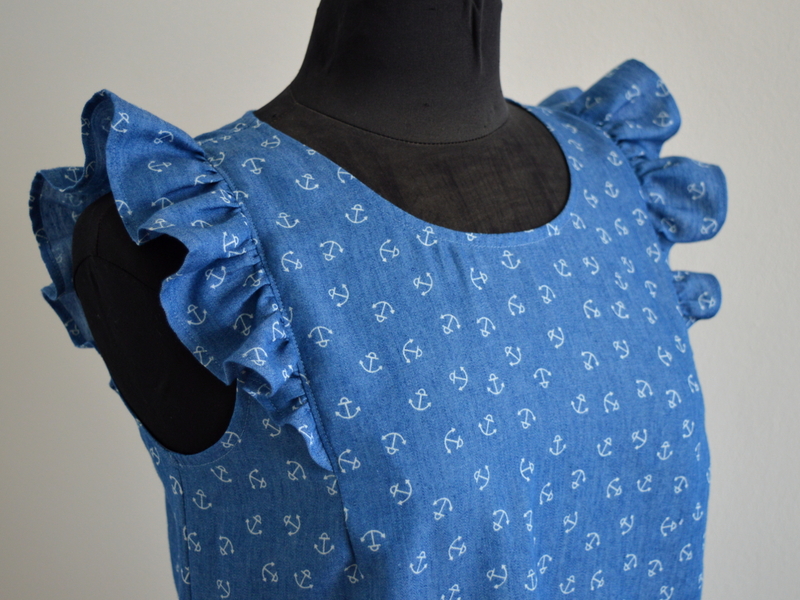 This version is made from some super stretch denim from Fabric Godmother. I'd seen it at their studio space during our recent Portslade bloggers' meet-up, but I didn't buy any because I was on a budget (which obviously got blown anyway). But I kept thinking about it so emailed Josie to check she still had some in stock in advance of their July Open day, hoping she'd put some aside for me if it was running low. Because she is the more generous and thoughtful lady, she sent me a length for free instead! 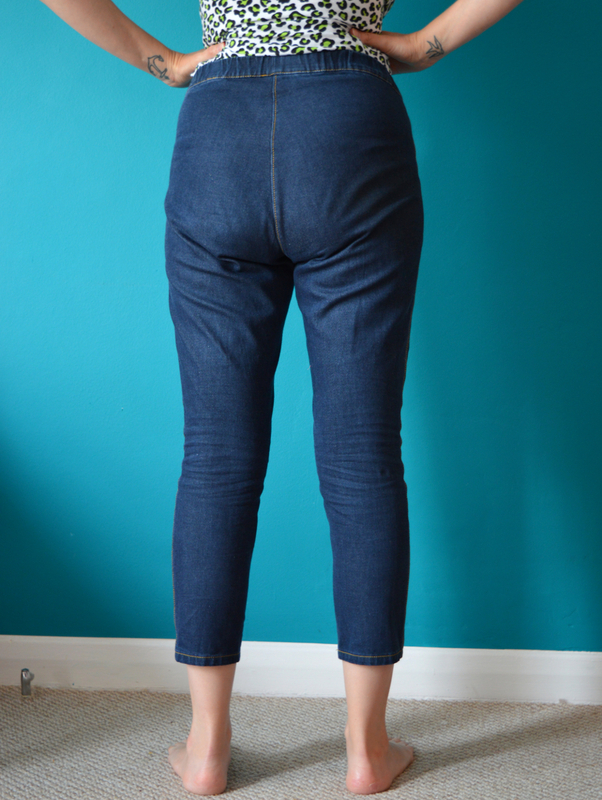 I'm not sure if she getting any more of this exact denim in stock (might be worth emailing her), but there are a lot of other fabulous similarly-stretchy denim on their site, including this blue that I also have some of. Ok, first the good points. These feel really comfy and generally I think they look pretty good, therefore I've worn them heaps since I finished them. These are a more recent make, they haven't had as much wear or washing as #1, however I'm pretty sure that they will fair better over time. These pictures were taken when they were fresh out the wash, but you'll have to trust me that the black denim doesn't get so saggy by the end of the day. The real flat felled seams have worked a charm and I don't notice the the outer leg seams at all. Now for the faults that I think I can improve on without inducing a headache. They still sit too high on my waist. It may not look like it, either in the flesh or in photos, but this is a personal comfort thing. When I wear them now, I tend to roll the waistband down to get it sitting where it feels most comfortable to me. 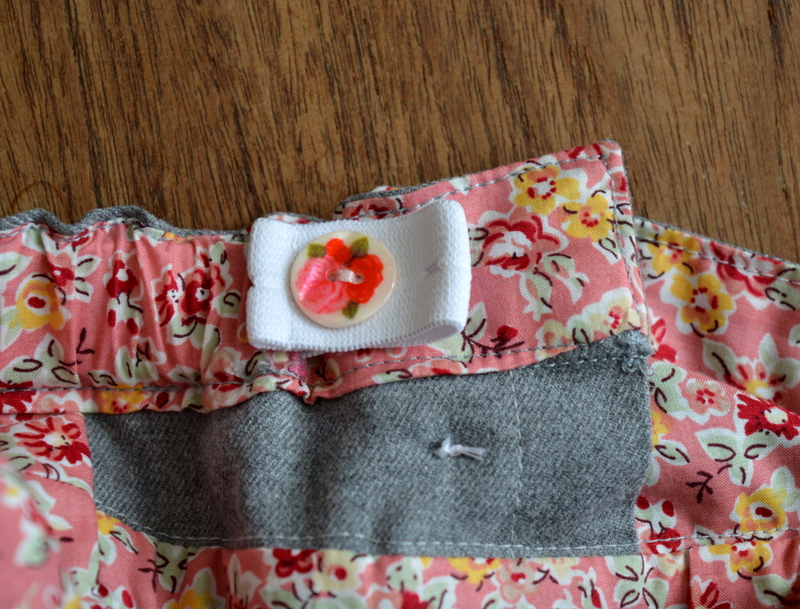 When I can muster the patience, I will go back and unpick and re-do it for a lower waistband permanently. Another simple flaw is that my patch pockets are sitting too low and too far to the outer leg seams. 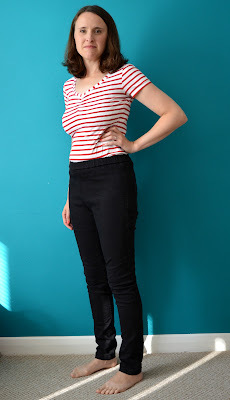 The height doesn't really notice too much as I always wear tops that cover at least the waist area of these jeggings (I've just got my top tucked in for these photos so you can see what's going on), but for future versions I need to make a note to position them a touch higher. I also think the wrinkles around the knee are because the jeggings are too long in the leg, so hopefully I can make those disappear easily enough. 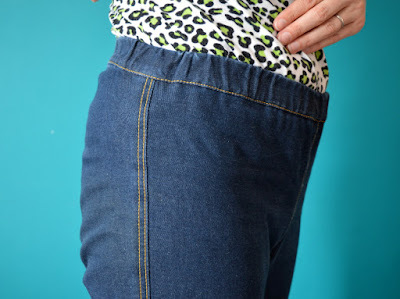 1) After an aha-moment whilst listening to the Melissa Fehr episode of the Crafty Planner podcast, I wondered if those wrinkles are a pooling of fabric caused by the fabric being pushed down because the fit is too tight across my bum (although they don't feel it). If that's the case then I do not have a Scooby-do (Cockney for clue) how to change my pattern to correct that. 2) Perhaps less visible in these photos, compared to the originals, like version #1, version #2 still feels too room-y around the pelvis and thigh area. The waist fits fine because I adjusted the elastic to be the correct length so they pull in sufficiently at the waist, but if I were to take in the side seams a smidge from the waist to the knee my theory is that there's less likely to be any wrinkles if the fabric is stretched more across my body. I guess this route would lead to a tighter, more sprayed-on effect like you see many of the 'youth' rocking these days. Annoyingly, I can't simply nip these in to test that theory because of the flat felled seams. 3) The issue could be the same one that my trouser-fitting saga is throwing up. 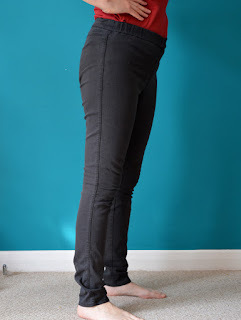 I might need to do some 'scooping out' of the back rise, or lowering the back crotch curve, or taking in the in-seam (although the latter may have cause me problems when I did that to my black pair of Ultimate trousers) because of some kind of low-bum issue or something. 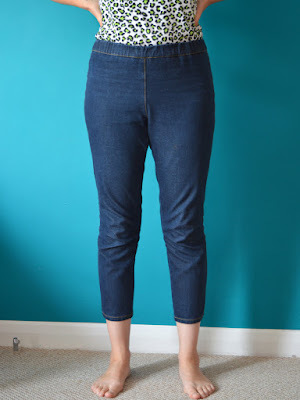 What is also clear, is that each different denim fabric would need its own unique sewing pattern to get the best version of jeggings possible. But without making a toile and the subsequent pair from the exact same fabric, I guess I'm going to have to forgo the real flat felled seams in favour of making a pair that can be adjusted at the seams to get a close-to-perfect fit for future versions. 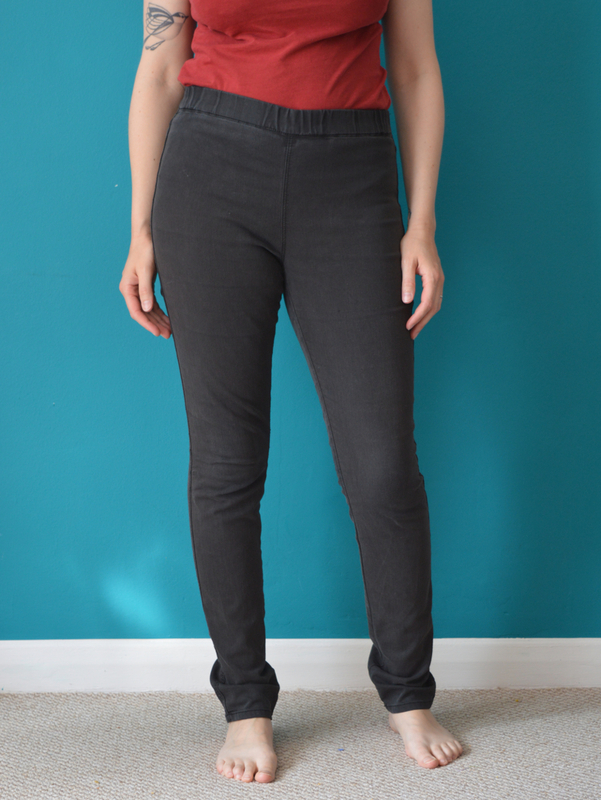 As it stands, I feel the jeggings are closer, but I'm determined to nail both. Then Frankie will pack in breastfeeding and winter will come and I'll put loads of weight on and have to make a whole heap of new pattern changes! Oh, and one day I hope to find the 'proper jeans' sewing pattern that appeals and use that as a base to work on that type of garment too. Hopefully, by then, I'll have learnt so much about trouser fitting and my personal shape that I'll have a heap of knowledge I can transfer to that. If you have any insights to my fitting issues, please do share your thoughts via a comment. And, how about you? 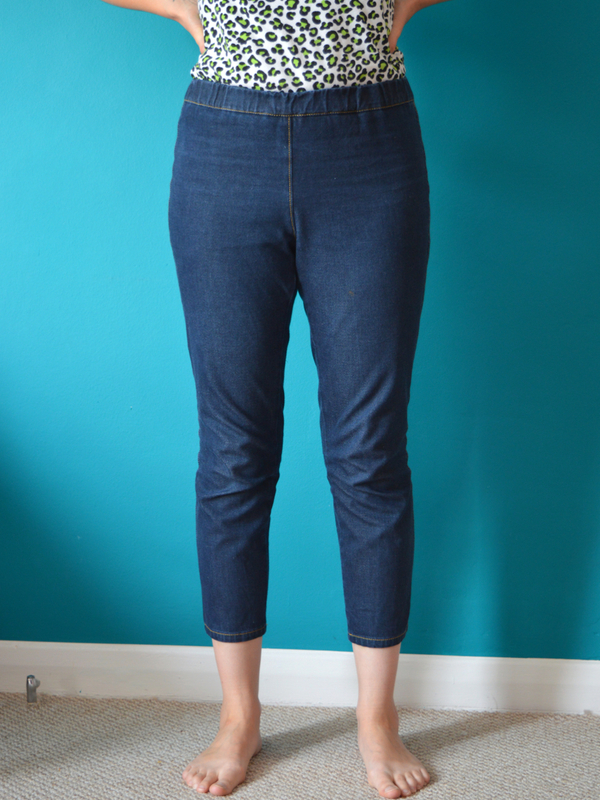 Do you ever wonder if you should just go to a shop and buy some trousers/jeans/jeggings instead?! Have you gone down the trouser/jeans/jeggings fitting rabbit hole and come out victorious? Please let me know!